How to search contacts by location (Address, Zip, City, State, Country)? Click on the downward arrow on the right side of the search box (see A). 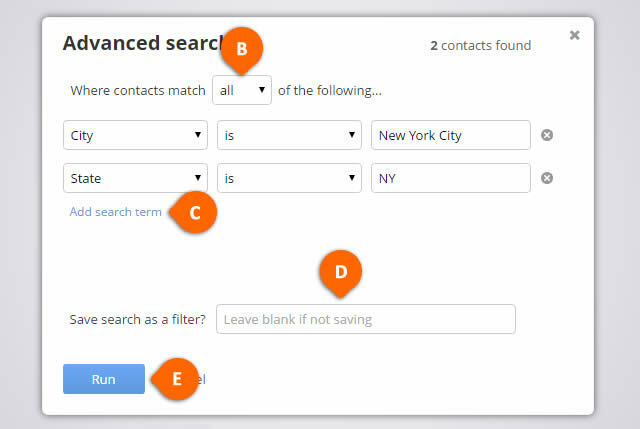 In the Advanced Search pop-up, select all from “Where contacts match of the following…” drop-down if you wish that contacts meet all selected criteria. Otherwise select the any option (see B). Select one of the location options (Address, Zip, City, State, Country) from the Address section of the provided drop-down list. To combine multiple criteria, click on the Add search term link (see C). To save this search, name it in the Save search as a filter? (see D) field (Optional). Click Run to generate the results (see E).